My trip to Paris and latest stitching. Hi everyone, I had a lovely time in Paris and thought I would show you some photographs from my little trip, together with Cindy F's birthday gift and Wendy's blog award. I have also posted all of my gifts from my anniversary giveaway, so all winners expect your gifts anytime soon! This was a beautiful building inside! I just loved this dress. furniture, pottery and perfume bottles. I thought this table was soooo beautiful, I know it is very over the top but I just love it! An example of the beautiful architecture. 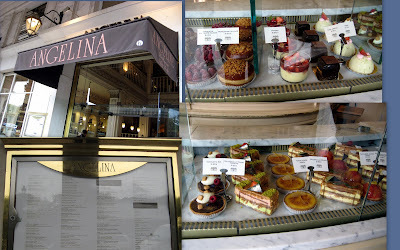 Of course, I did have to visit this wonderful tea shop for afternoon tea! A visit to Angelina's was really nice too! 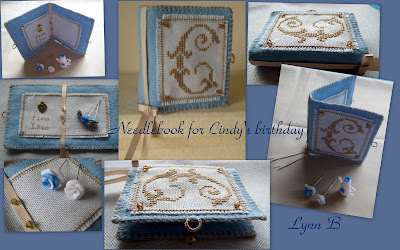 Here is a needlebook that I stitched for Cindy's birthday. 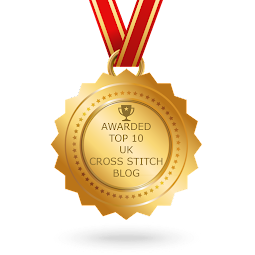 I am currently stiching for exchanges and I am making some gifts, I have also nearly finished my September stitching for the Christmas Challenge blog and I am getting organised with my Christmas stitching. I have signed up for the Halloween Exchange on the Hooked on Exchanging blog, I just love stitching halloween projects, they are so much fun to stitch. I have been asked for finishing instructions on my projects, I have finished one but I have not had time to post it yet, but I will do soon! I hope you enjoyed my photographs of Paris, thankyou for your visit, please call again! My trip to Bath and recent exchanges. I thought I would show some photograph's of my recent visit to Bath in England where Jane Austen lived for five years. A window display in the Jane Austen Centre. We had tea at the famous Sally Lunn tea shop, the food was delicious. The house was built in 1475! Georgian style dress and I would feel complete! I found a very pretty bead shop in this square called Bijoux Beads here , of course I had to buy some! The Celebration Of Creation by Sue Symons, the pieces were amazing, Sue is one very talented lady. 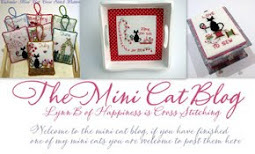 I have other photographs that I can show you in another post, if you love embroidery you will love these photo's! Sue has had her art work published, you can find more details here. If you wish to visit Bath here is a helpful website. I have just received a beautiful exchange from Shay in the Year Long Prairie Schooler exchange group and I must say the photograph cannot possibly do this beautiful piece of work justice. Shay made a stitching book with tatted lace inside and gorgeous roses on the outside, the stitching and finishing are perfect and I am thrilled to own such a beautiful piece of work. I shall treasure this always. Here is the little pillow I made for Joke in the same round. I just love it there, I usually visit every year and I always look forward to going. I will remember to take photo's to show on my blog when I return. to get inspired for my needlework. I will post the other prizes when I return from my holiday. Thankyou so much for your lovely comments, I always love reading them! The winners are...... more prizes added and lots of pictures! not enough gift's for everybody but eventually I did put all the names into a hat and picked out the winner's and here they are! Congratulations to all the winner's. I will post the gifts no later than the end of September, you may get them sooner but I like to give a late deadline to give me plenty of time, I have also not made all of the rose pins yet or the extra coffee pots. I would also like to put in a disclaimer at this point, I will post all items but if anything gets lost in the post I am afraid I will not be able to make any of the items again - sorry but you know it can happen and I just wanted to cover myself on that point. I have been asked on a number of occasions how I finish various items, so I decided to put my own finishing instructions together for a pinkeep. My next post will show pinkeep finishing instructions for the Tea pinkeep below, there are easy to follow photograph's with tips on how I finish my work. 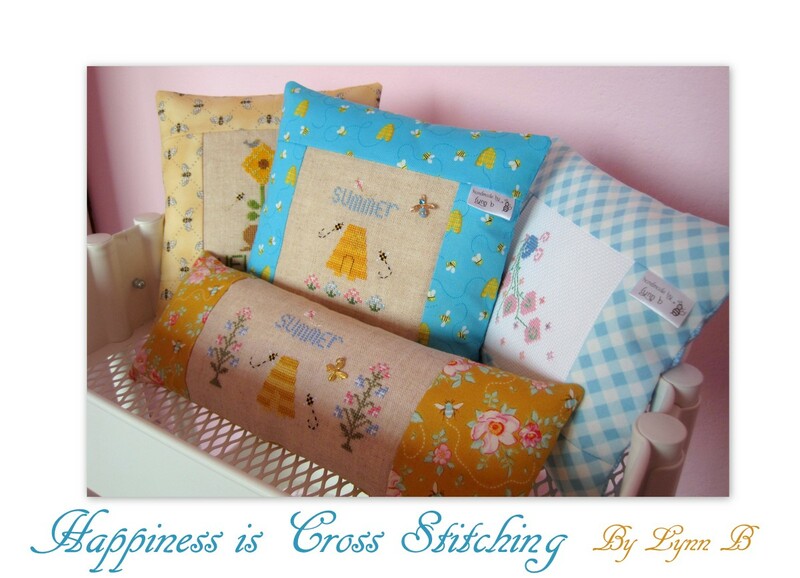 I entered the village show today with my cross stitch gifts, I won first prize and a trophy for Best in Crafts, yay! My Mother won first prize for her card making skills and second prize for a cottage cross stitch. Fourth prize - A little tea if you please. Here are a selection of the fimo roses that are offered as the 5th, 6th and 7th prize although the roses may not be exactly the same colour as those in the picture. 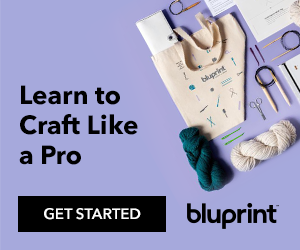 you will get detailed instructions on how to make them. boxes but I have never seen the larger one's. All these gorgeous fabrics, they were much cheaper than England! tatting but it is on my list of things to do. Don't you just love the yummy colours of the ribbons-mmmmmm! I saw these paints that are perfect for my painting on fimo clay, the oils are to use in my parchment craft, although it is a while since I have created cards in parchment I always like to have things in stock just in case I feel a card making day coming on! This is the lovely gift I received from Wendy. Last year I completed a lovely butterfly embroidery which I showed to a friend and she loved the design, whilst in America I saw the kit and just had to buy it for her, I told her I had got something very special in cross stitch but did not tell her what it was, nor did I tell her she was the recipient, so now you know Diane, if you read this post this is the special gift for you! Thankyou for your visits and wonderful comments! Back from holidays and free pattern. Hi everyone, I am back from my holidays and we all had a wonderful time! anniversary giveaway, I am delighted that so many of you liked it. I am currently replying to everyone who left a comment, however some comments do not permit me to respond because of the setting on your email reply. I have visited all of your blogs and I must say I have seen some beautiful creations out there, you are all sooooo talented, I have found lots more inspiration. Don't forget that I will not be announcing the winner until this Saturday (5 September ) as I am currently putting all the little bits of paper into a bowl! Because so many of you commented I am contemplating adding a few more prizes, I may make some more rose pins but I will keep you all in suspense for now! Lol! I am planning another giveaway, hopefully in time for Christmas, I hope you will all return for that and join in the fun. 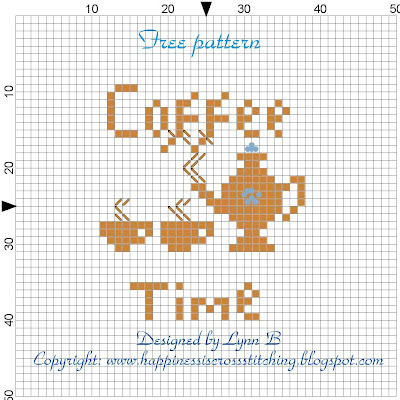 As you can see I have posted the free pattern, it is the first time I have used my cross stitch programme so I really do hope you can download the picture, I really struggled to know what to do with it. 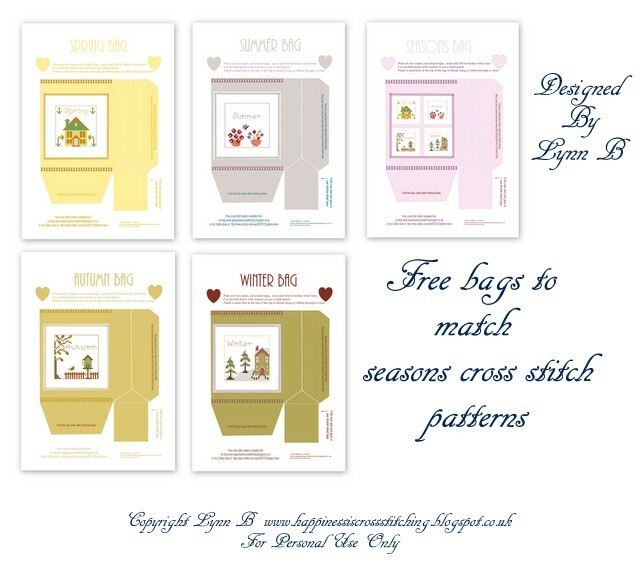 My husband bought me a cross stitch design programme for my birthday in April and I am just about getting used to it - watch this space for more free cross stitch patterns. Whilst I was away I bought a few things for my stash, I will be taking photo's this week to show you all. I bought some really pretty boxes that I have not seen in England, (I am certainly looking forward to decorating them) and I bought some fabric, it was so much cheaper in America. 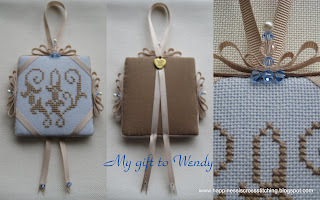 I had the pleasure of meeting Wendy from Wendy's hobbies blog, we had a lovely little meeting and exchanged gifts, I made a pinkeep and Wendy gave me a cross stitch kit, I will be posting pictures in my next post. The weather was 95 degrees, phew it was too hot for me, I had the factor 30 sunscreen on, I am really fair skinned so I am pretty much the same colour as when I set off on my holidays! Lol! When I am on the beach someone always says to me ''oh you are so fair skinned aren't you'' mmmm like I don't know already!!!!! If I had a pound (or a dollar) for every time I have heard that I would be rich! Thankyou once again for all of your lovely comment's and encouragement, I will be back Saturday with the winners names!